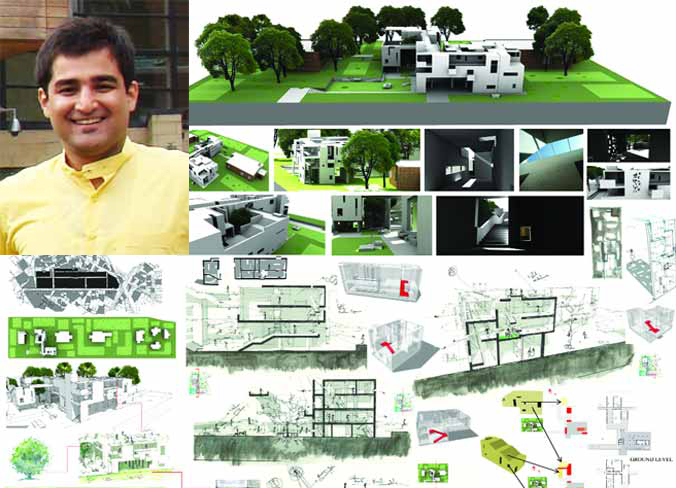 Chandigarh, India: Fasih ud din Khan, a young architect from Lahore Pakistan has made Pakistan proud by winning the first prize in the best Thesis of the year competition. He graduated with Distinction, in year 2010, , from Beaconhouse National University, School of Architecture, Lahore, Pakistan and is presently working as an in-house Architect for Imran Khan Foundation. He is currently involved with the master plan of Imran Khan’s Namal University Project spread on 1000 Acres site. The “Young Architects Festival” from 14-16 October, 2011 was organized by The Indian Institute of Architects (IIA), Chandigarh-Punjab Chapter. About 750 architects, urban planners, interior designers and students of these professions from India and abroad attended this Festival. The idea of the Thesis titled: Spatial Porosity in Architecture is to understand the earth, its natural formation, processes of transformation, its composition, material qualities and relating architecture with it. Fasih is presently working as an in-house Architect for Imran Khan Foundation. Thanks for your comment Kabani.